The earliest record of a professional black musician in Bristol that I could find dates from 1773. In that year an unnamed black musician from Wilder Street is recorded as teaching the fife – an early version of the flute used extensively by military musicians – to a young boy at the Full Moon Tavern, Stokes Croft. In the same century, it is most probable that the regimental bands of the city’s many army units will have supported one or two black musicians, but as yet their presence has yet to be confirmed from existing and reliable records. 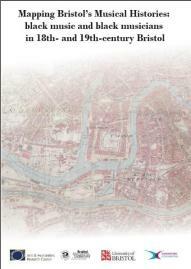 The closest reference that does exist shows that two black bandsmen from the Somerset Militia (southern parts of what we now define as the city of Bristol were part of Somerset until the 19th century) were involved in a fight with white soldiers from another regiment. At the other end of the history of black music and black musicians in 18th- and 19th-century Bristol, towards the end of the latter century the city, and the rest of the country, was home to an increasing number of black African-American gospel choirs. The religious influence of the gospel singers is significant, even today; in musical terms, African-American Gospel music can trace its origins to African-American spirituals, American folk music, and early blues and jazz.